. . . the picture is less clear about how many will actually be able to maintain themselves in Redfish Lake. A report has been commissioned to study that issue, . . .
IDFG's new $13.5 million sockeye hatchery was dedicated Sept. 6, when officials gathered at Springfield, Idaho to open the facility for its singular purpose--to play a major role in restoring wild sockeye to Redfish Lake and other nearby lakes in the Stanley Basin. Those sockeye were the first Columbia Basin stock listed for protection under the ESA in 1991, and have been on life support ever since. The new facility is designed to produce 1,000,000 sockeye smolts every year, boosting annual releases five-fold. 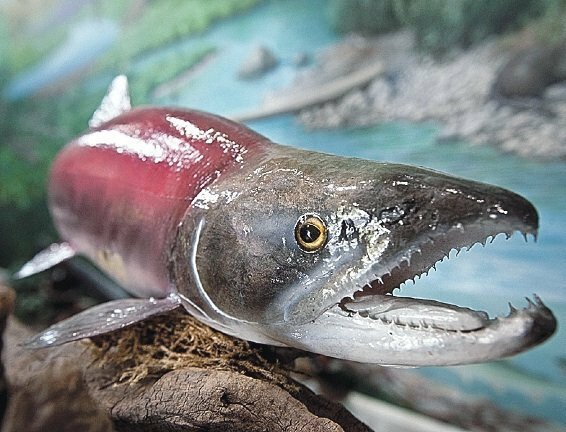 "The story of the Snake River sockeye is one of perseverance: Their numbers were once so depressed by harvest, predation, habitat loss and dams that many in the scientific community declared them functionally extinct," said Lorri Bodi, vice president of Environment, Fish & Wildlife for the Bonneville Power Administration, in a statement. "But these fish are survivors, and the state of Idaho, BPA, Shoshone-Bannock Tribes and other stakeholders weren't willing to give up on improving conditions for these fish. The Springfield Hatchery is just one piece of a larger effort that has proven successful in bringing back the Snake River sockeye." Returns have rebounded from some years with no returns in the mid-1990s, with the help of an expensive captive broodstock program, improved dam passage and better ocean conditions. This year, 743 were counted at Lower Granite Dam, but poor river conditions reduced their numbers during the last 450 miles of their migration back to Stanley Basin, compared to recent years. IDFG has reported fewer than 200 have made it back in 2013. More than 1,300 sockeye returned in 2010. There is already a buzz developing over a potential fishery for future sockeye returns to Idaho, but the picture is less clear about how many will actually be able to maintain themselves in Redfish Lake. A report has been commissioned to study that issue, while interim recovery goals for the sockeye have called for establishing self-sustaining populations of 1,000 in Redfish Lake and 500 each in two nearby lakes.